Water tracks are zones of enhanced soil moisture that route shallow groundwater downslope in permafrost regions. Water tracks form in the active layer (the seasonally thawed portion of the permafrost) where melt water derived from snow-melt, ground ice melt, and exotic processes like salt deliquescence, concentrates in broad depressions in the ice table (the part of the permafrost that remains frozen) and flows downhill. Water tracks darken and lengthen during the summer melt season, and freeze-dry in winter, rendering them nearly undetectable from late fall to early spring. Image 1. 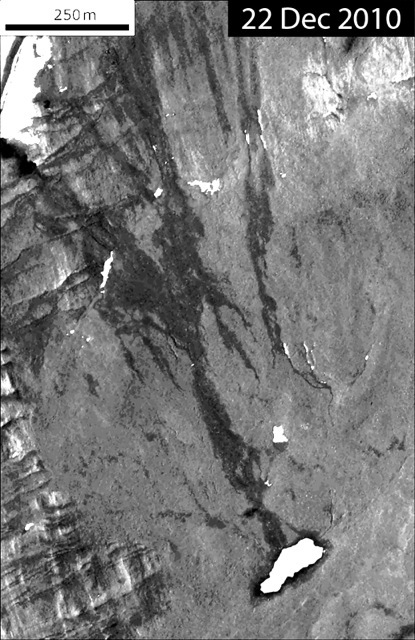 Quickbird satellite image of a water track in the vicinity of Lake Hoare, McMurdo Dry Valleys, Antarctica. Near-surface groundwater flows downhill from the top of the image towards the ice-covered pond at the bottom. Portion of Quickbird image orthowv02_10dec222046120-p1bs-103001000825e900_u08ns4326. Water tracks are often thought of as “zero order” channels, although they can also form dendritic drainage networks on permafrost hill slopes. Water tracks are typically a few meters wide and range in length from a few tens of meters to several kilometers, depending on the volume of water available for transport and local hill slope topography. Water track liquids wick to the surface through capillary action and darken the soil above the groundwater flow. At breaks in slope, water track fluids can discharge at the surface as groundwater seeps. In Antarctica, evaporation of water track brines can leave behind fringes of bright efflorescent salts around the edges of the flow feature. Water tracks are persistent features of the polar landscape, and have been shown to occupy the same broad channels for up to a century. As a result, water tracks are locations where chemical weathering is most active in the polar desert, and are hotspots for biological activity in the Antarctic soil environment. Image 2. RSL at Palikir Crater, Mars, in the early season (left) and the late season (right). RSL flow downhill from the rocky cliffs at right to the sandy slopes at left. White bars shown the distance that individual RSL have flowed. Left image is a portion of ESP_022267_1380. Right image is a portion of ESP_022689_1380. Martian surface features called recurring slope lineae (RSL) have similar morphological and seasonal characteristics to water tracks. RSL are narrow (0.5-5 m wide), relatively dark-toned features that form on steep (25-40˚), southern-hemisphere slopes, and that appear in early spring, grow longer in the downslope direction during spring and summer, and fade during autumn and winter—behavior identical to water tracks on Earth. Several hypotheses have been proposed to account for the formation of RSL, of which the preferred mechanism is shallow percolation and flow of liquid water and/or brine. This inference is based in part on the presence of RSL only on southern hemisphere slopes with warm summer temperatures (>250 K) and also on RSL summer-season growth and winter-season fading. This darkening/fading pattern is consistent with downslope transport of a water-based fluid that darkens the RSL surface through grain-wetting as it flows through near-surface soil pores, and that sublimates/evaporates once flow ceases after the summer thermal optimum. Analysis of average RSL flow rates suggests that they are consistent with flow of liquid water or brines through sandy sediment. As a result, RSL are the first direct evidence of water-based liquids flowing in the near-surface environment of modern Mars. Grimm, R.E., Harrison, K.P., Stillman, D.E., and Michaels, T.I., 2013, Water Budgets of Martian Recurring Slope Lineae: LPSC Abstract #1146. Harris, K.J., Carey, A.E., Lyons, W.B., Welch, K.A., and Fountain, A.G., 2007, Solute and isotope geochemistry of subsurface ice melt seeps in Taylor Valley, Antarctica: Geological Society of America Bulletin, v. 119, no. 5-6, p. 548–555, doi: 10.1130/B25913.1. Levy, J., 2012, Hydrological characteristics of recurrent slope lineae on Mars: Evidence for liquid flow through regolith and comparisons with Antarctic terrestrial analogs: Icarus, v. 219, no. 1, p. 1–4, doi: 10.1016/j.icarus.2012.02.016. Levy, J.S., Fountain, A.G., Gooseff, M.N., Welch, K.A., and Lyons, W.B., 2011, Water tracks and permafrost in Taylor Valley, Antarctica: Extensive and shallow groundwater connectivity in a cold desert ecosystem: Geological Society of America Bulletin, v. 123, no. 11-12, p. 2295–2311, doi: 10.1130/B30436.1. 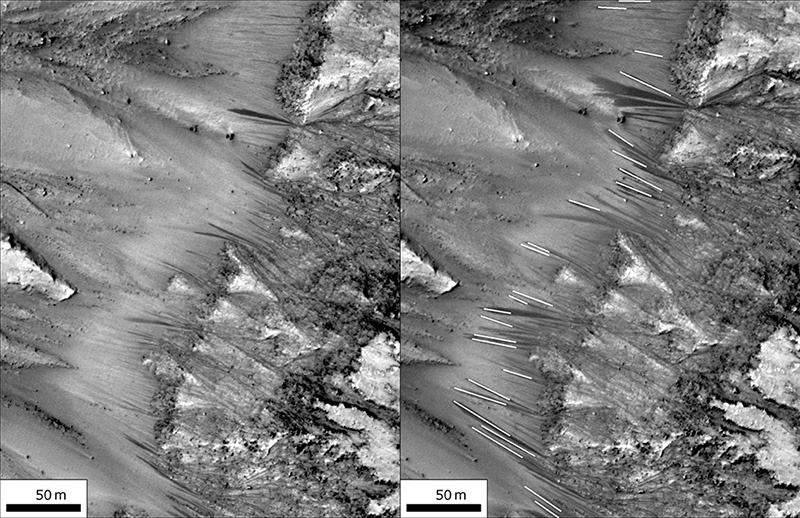 McEwen, A.S., Ojha, L., Dundas, C.M., Mattson, S.S., and Byrne, S., 2011, Seasonal flows on warm Martian slopes: Science, v. 333, no. 6043, p. 740–743. McNamara, J.P., Kane, D.L., and Hinzman, L.D., 1999, An analysis of an arctic channel network using a digital elevation model: Geomorphology, v. 29, no. 3, p. 339–353. Stillman, D.E., Grimm, R.E., Michaels, T.I., and Harrison, K.P., 2013, Formation of Recurrent Slope Lineae (RSL) by Freshwater Discharge of Melted Cold Traps: LPSC Abstract #1737. Toner, J.D., and Sletten, R.S., 2013, The formation of Ca-Cl-rich groundwaters in the Dry Valleys of Antarctica: Field measurements and modeling of reactive transport: Geochimica et Cosmochimica Acta, v. 110, p. 84–105.